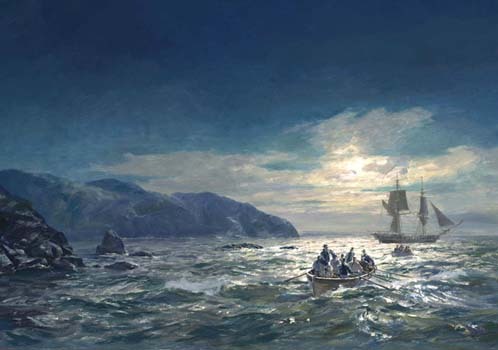 Limited edition marine art prints featuring Geoff Hunt's stunning images used for the covers of Julian Stockwin's series of historical novels about Thomas Kydd. Limited edition prints of Geoff Hunt's images featured on the covers of all the books are available in this section. Julian Stockwin writes: "Each year Geoff and I have a most enjoyable discussion about the cover of the next book. Geoff actually reads the while manuscript and I can only admire his talent in distilling the essence of each book in one superb visual experience......To me his paintings, perhaps more than those of any other artist, have a compelling immediacy and sense of vitality, especially in his work of the great age of sail, a love we both share."